There was a couple who used to go to England to shop in a beautiful antique store. This trip was to celebrate their 25th wedding anniversay. 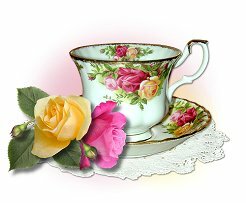 They both liked antiques and pottery, and especially teacups. Spotting an exceptional cup, they asked, "May we see that? We've never seen a cup quite so beautiful". As the lady handed it to them, the teacup spoke. "You don't understand", the teacup said, "I have not always been a teacup. There was a time when I was just a hump of red clay. My master took me and pounded me and patted me over and over and I yelled out, 'Don't do that! I don't like it! Leave me alone!' But he only smiled and gently said, 'Not yet' ". "Then WHAM! I was placed on a spinning wheel and suddenly I was spun around and around. 'Stop it! I'm getting so dizzy! I'm going to be sick!' I screamed, but the master only nodded and said, 'Not yet'. He spun me and poked me and prodded me and bent me out of shape to suit himself and then... then he put me in the oven. I never felt such heat! I yelled, and knocked, and pounded on the door, 'Help! Get me out of here!' I could see him through the opening, and I could read his lips as he said, 'Not yet'. Then suddenly he put me back into the oven. Only it was not like the first one. This one was twice as hot and I just knew I would suffocate! I begged. I pleaded. I screamed. I cried. I was convinced I would never make it. I was about ready to give up. "Quietly he spoke, 'I want you to remember, then,' he said, 'I know it hurt to be rolled, and pounded and patted, but had I just left you alone, you would have just dried up. I know it made you dizzy to spin around on the wheel, but if I had stopped, you would have crumbled. I know it hurt and it was hot and disagreeable in the oven, but if I hadn't put you there, you would have broken. I know the fumes were bad when I brushed and painted you all over, but if I hadn't done that, you never would have hardened. You would not have had any color in your life. If I hadn't put you back in that second oven, you wouldn't have survived for long because the hardness would not have held. Now you are a finished product. Now you are what I had in mind when I first began with you. God knows what He is doing in each one of us. He is the potter and we are His clay. He will make us and mold us, and expose us to just enough pressures of just the right kinds that we may be made into the flawless piece of work to fulfill His good, pleasing and perfect will. Brew a cup of your favorite tea in your prettiest teacup, sit down, and have a little talk with the Potter.